In parallel to the EU-US trade deal currently under way, the US is negotiating a similar agreement with 11 countries of the Asia Pacific: the Trans-Pacific Partnership (TPP). Walden Bello, leading critic of neoliberal and corporate globalisation, identifies the global strategy underpinning the two agreements. Interview. 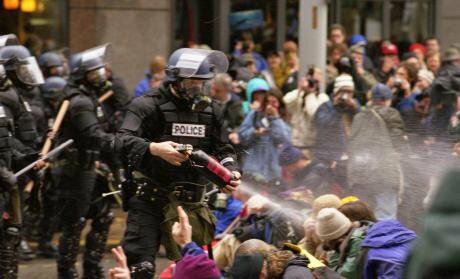 Protests against the WTO in Seattle in 1999. Steve Kaiser/Wikimedia Commons. Some rights reserved.Thomas Fazi: Today bilateral and regional ‘free trade agreements’ – or better, mega-regional agreements, such as the TTIP and TPP – have effectively replaced negotiations within the WTO. Have we entered a new phase of globalisation? Walden Bello: Yes. I think the triumphalist phase of globalisation, which peaked in the 1990s and then started to decline after the 1999 Seattle mobilisations, is definitely over. Today we are in a situation where corporate-driven globalisation and neoliberalism have led to a major crisis, and are on the defensive. We could say that the very concept of corporate-driven globalisation is in crisis. Its credibility has been severely damaged. But of course there are still very strong interests – supported by technocratic elites and most of academia – that continue to push for neoliberal solutions, such as the TTIP and the TPP. TF: How much did the anti-globalisation and anti-free trade movement of the late 1990s and early 2000s help undermine the paradigm of corporate-driven globalisation? WB: I think the movement’s most important achievement was that it really shocked the triumphalism and the credibility of the whole project of corporate-driven globalisation. Seattle was a very historic event, in which the action of the people in the streets finally revealed that the emperor had no clothes. Even prior to Seattle it was already clear in so many statistics that globalisation was leading to greater poverty and inequality and was creating all sorts of inefficiencies, but somehow that truth was not getting through. In Seattle the paradigm was definitely shattered. What we witnessed wasn’t just the collapse of the WTO ministerial – it was the collapse of the whole paradigm. I think this was the clear achievement of the anti-globalisation movement: that it really showed that there was a dark side to globalisation, that it was creating the opposite of what it promised. The erosion of the WTO has been very critical, because this was supposed to be the prime instrument of globalisation. We are talking of the most ambitious commercial legal code ever created, and this architecture is now at a standstill. This is why in recent years they have begun to move back into bilateral and multilateral free trade agreements (FTAs). But FTAs – pushed primarily by the EU, the US and Japan – are seen by these countries as a second-best arrangement, resulting from the failure to reach the sort of universal consensus that they had tried to work out within the WTO. This is not to underestimate the very deleterious impact of agreements such as the TTIP and TPP. But I think they are also very fragile. Just look at the growing opposition of civil society to the TTIP in Europe, or the resistance of agribusiness interests to the TPP in a number of Asian countries. TF: What are the similarities between the TTIP and the TPP? WB: The two treaties are very similar. Firstly, they are both being negotiated in secret; as the former US trade representative Ron Kirk said, if they were negotiated openly they wouldn’t stand a chance of being approved by people. Secondly, they are not so much about trade, although there are trade aspects to them (such as further reductions of tariffs); they are really about asserting corporate control over every aspect of our lives, through intellectual property rights and investor-state arrangements (the infamous ISDS), in which basically the sovereign rights of states are curtailed by the ability of corporations to sue them. Thirdly, they both have a geopolitical component: the TTIP is really the economic arm of NATO and is clearly aimed at containing Russia; the TTP, on the other hand, is obviously a very strong attempt to contain China, and to create an opposite economic bloc in Asia. More in general, I think it’s very clear that among the targets of both projects is the emergence of the BRICS and the efforts underway to create an alternative economic bloc to the western one. Finally, I think that both the TTIP and the TPP have an ideological component to them, in that they are being asserted as representing the ‘good’ western values – free trade, civilization, rule of law, etc. – as opposed to the alien values of ‘the other’. This also underscores the hypocrisy of the ‘free trade’ narrative: in a consistently free trade framework, these agreements should be extended also to countries like Russia and China. But that is clearly not the case. TF: Would it be correct to view these agreements – and especially the TPP – as forms of neocolonialism or neoimperialism, in the same vein as the FTAs imposed by hegemonic nations to developing countries in the past? WB: Considering that the geopolitical aspect is so prominent to both – in both cases we are not dealing with ‘simple’ trade agreements but with treaties where the political and security aspects are at least as prominent as the economic aspects – one could in fact say that there is an element of neoimperialism at play. There is a clear effort on the part of the hegemonic powers (the US and Europe), through these treaties, to strengthen and enlarge their sphere of influence and stem the threat posed by those forces that have the potential to displace the prominence of the west. TF: Is the TPP linked to US military expansion in the Pacific? WB: Yes, absolutely. Just like the TTIP can be considered the economic arm of NATO, the TTP is definitely linked to US military expansion in the Pacific and the whole ‘pivot to Asia’ strategy, which is fundamentally aimed at containing China. In this sense, these agreements risk having a serious destabilising effect in geopolitical terms. TF: You mentioned the issue of secrecy, which is one of the most controversial aspects of the TTIP negotiations. We know that in the case of Europe even the national parliaments are often unaware of what is being discussed, as the whole thing is very much negotiated at the Commission level. How are the negotiations taking place in the Asia Pacific, where the US does not have such a ‘privileged’ counterpart? WB: What’s happening is that the deal is basically being negotiated by top trade negotiators. And corporations are being given special access to them, but not the general citizens and not even the national parliaments. So basically the big business groups in these countries are the ones that have access. This is totally anti-democratic. Parliaments should have this access. I’m really quite puzzled as to why this is not being challenged, why parliaments are not making a stronger challenge to this non-transparency, or making use of the various freedom of information laws in these countries. I think part of the problem is that parliaments in most countries that are covered by these agreements are dominated by conservative parties that are ideologically partial to neoliberalism and are linked to corporate capital, and do not prize transparency. The same, of course, applies to Europe. TF: In recent years a number of Asian countries – such as the former ‘Asian Tigers’ – have reacted to the disastrous effects of the IMF- and World Bank-imposed ‘structural reforms’ by pursuing more protectionist policies and partly ‘rolling back’ the process of globalisation. How is this influencing the negotiations over the TTP, which goes in the opposite direction? WB: Globalisation has always strongly emphasised export-oriented production, but the downturn and long-term depression in the US and Europe, which were central key markets for Asian exports, has forced many Asian countries to re-examine the political economy models that they were pursuing. I think that in many countries there has been a realisation that they had to move back into domestic demand-oriented growth, and what that means of course is that among other things you really need to pay attention to your internal market, and to a more equal distribution of income. And that has meant using whatever little space is left to impose restrictions on trade, through sanitary and safety standards, as well as on financial flows, through capital controls (which even the IMF has recently acknowledged as being effective in preventing destabilising crises). In this sense, agreements such as the TTIP and TPP, which are an attempt to stop this process of de-globalisation, are riding against the tide of history. The same can be said for the German-led, neomercantilist strategy pursued by Europe. TF: Speaking of Europe, social movements in the late 1990s and early 2000s were successful in rallying hundreds of thousands of people against neoliberal globalisation. Today this seems like an impossible feat, even though the agreement currently being negotiated, the TTIP, concerns European and US citizens much more directly than past FTAs. WB: The dynamics of movements are closely linked to the contradictory dynamics of crisis. For example, we should ask ourselves why, in the midst of the crisis, so many European countries swung to the right. I think this shows that crisis brings about its own dimensions, that often take away from the energy of political movements. Nevertheless, the devastating social effects of four years of austerity programmes in Europe are creating the conditions for the re-emergence of a strong anti-neoliberal and anti-corporate movement. The question is: who will be able to harness the anger of the people, will it be the radical left or the populist right? Regrettably, the latter seems to be gaining the upper hand at this point in time. I think the left really has to move very quickly.